Do you have an old iPhone and you are looking for ways on how to clear old iPhone? If yes, then you are in the right place. No matter what reason you are going to clear your old iPhone, you can get the answer in this article. Especially if you need to resell or give away your old iPhone, it is necessary to wipe all your personal data out before it going to other hands. Or you just want to clear some junks to free up more space, and now you can do it in a fast and easy way. If you are thinking of clearing your old iPhone and free up space, you need a professional tool to help you. iMyFone Umate Pro is the tool you need to completely clear you old iPhone and give it a new lifeline. 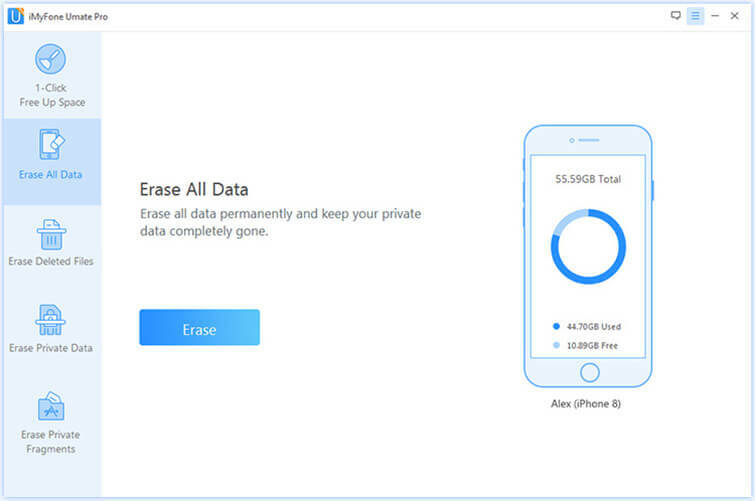 iMyFone Umate Pro for Windows or iMyFone Umate Pro for Mac is the ultimate iPhone data eraser that lets you permanently erase your device not only to clear the junk files but to also protect your privacy. You might think that your old iPhone will no longer have your personal data once you have deleted them. Unfortunately, the deleted items are only not visible to you but they are still stored on your device. This means that if you sell or give away your gadget someone else can retrieve the data and maybe use it illegally. Therefore, permanently deleting the data is important. It can help you clear your old iPhone permanently with 0% recovery. Secure your private data before selling by clearing your old iPhone completely. It can even help you find out your deleted files and erase them permanently. 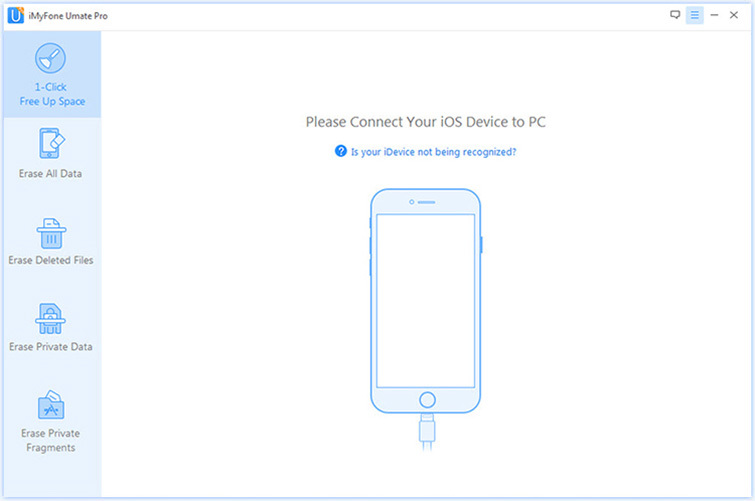 Step 1: Download, install and launch iMyFone Umate Pro on your computer. Then Connect your device to the computer via a USB cable. Step 2: On the left panel of the program choose Erase All Data button. Then click on the Erase tab. Step 3: Choose the Security Level and then confirm. You will see three different security levels. Choose the medium security level as your preferred choice. Step 4: Manually type ‘delete’ in the provided box, confirm your intended action and then click on the Erase Now button. This will erase all data on your iPhone. You do not have to give away or sell your precious iPhone simply because it is old. No, you can transform it and continue using it. You can change your old iPhone into something valuable that you can enjoy having around you. You can use this tool for a number of uses, for example, you can use this tool for transferring your music files to iTunes and build your music library, backup your media files to your PC, transfer and manage photos and even change your old iPhone into a dedicated camera, manage your apps, manage your music files and so on. So, what can you do with your old iPhone? You can use your old iPhone like an iPod touch. All you got to do is to use iMyFone TunesMate to transfer all your favorite media files between iTunes, your computer, and your device and build your custom music library. We all know the superior quality of the iPhone’s camera. If your old iPhone still has a good camera, you can use it as a dedicated camera. With iMyFone TunesMate, you can transfer all your photos to your PC once the device’s memory gets full. You can also give your old iPhone away to someone else who might find it useful. 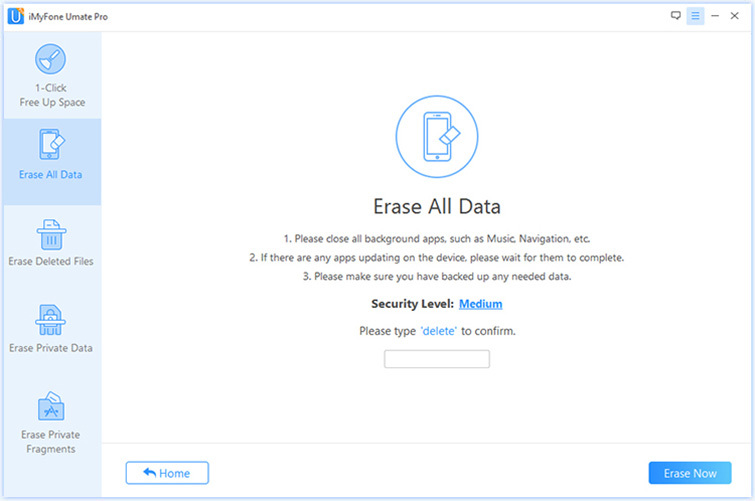 However, before giving it away ensure that you clear your old iPhone completely using iMyFone Umate Pro for Windows or Mac to protect your personal data. You can also transform your old iPhone into a media streamer. You can download videos, transfer music files, and photos to your computer or iTunes or simply use your iPhone as a hard drive for streaming media. With iMyFone Umate Pro, you can clear your old iPhone, free up space and improve its performance. If you no longer require to use it as a phone, you can still use it for other purposes and still enjoy having it around.